Imagine you have a big, beautiful salad in front of you- fresh greens piled high, sprinkled with a few of your favorite toppings. Maybe you don't have to imagine this. 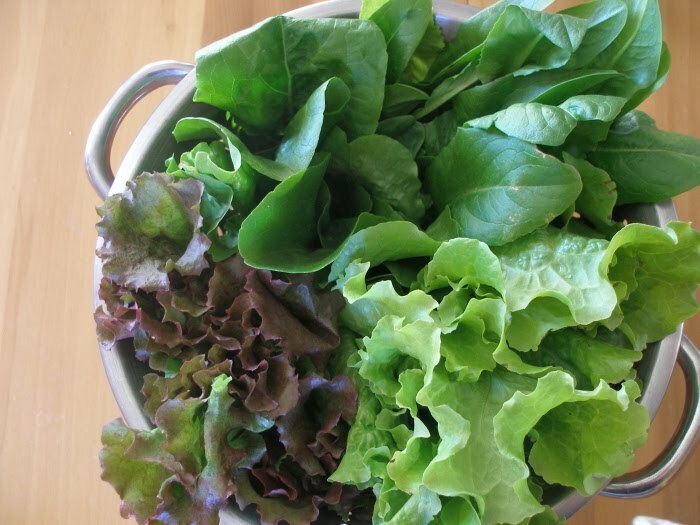 Maybe, just maybe, the lettuces from your garden are ready for the picking and you've already been enjoying fresh, garden salads, often twice a day, as we have been. I adore salad in the spring. We also grow lettuce in the fall and I enjoy it then as well, but at that point, I'm a little (or not so little) burnt out on all things garden related. Yes, it's possible. In the spring, next to asparagus, fresh salads are our first tastes of fresh, green produce. Mercy. 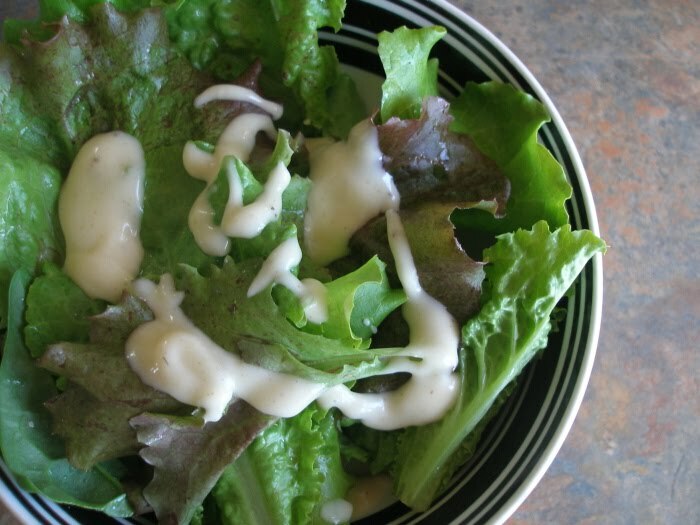 Last year, I discovered how easy it is to make your own salad dressings, but this year I am sugar free and had to make some changes to my salad dressing recipe selection. Imagine that big, heaping salad in front of you again. 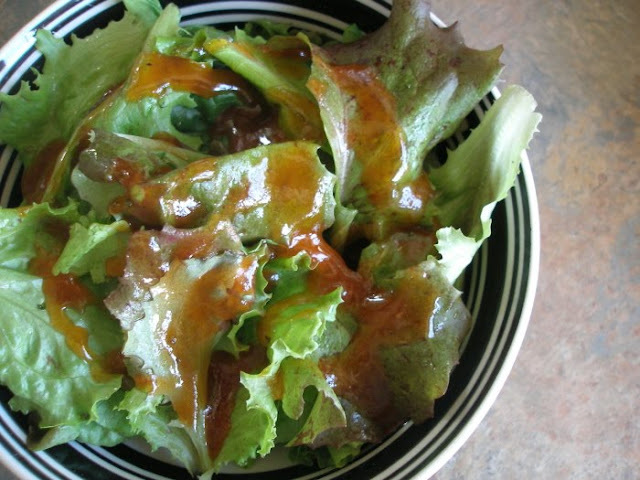 Now imagine that you are drizzling delicious, tasty, processed sugar-free dressing on top. Now, snap out of it and jot down these recipes. They are delicious. We love them. They taste so much like the white sugar versions, it's uncanny. If you've never made your own dressing before, do not be afraid. All ingredients go into one container (we using canning jars), get a good stir and that's it. This recipe makes 1 quart of dressing. Combine all ingredients in a quart jar and stir well. Refrigerate. This recipe makes about 2 1/2 cups dressing. Combine all ingredients in a jar and stir well. Refrigerate. What kind of oil do you use? I can never find the right kind and my dressings always end up tasting disgusting! Pam, I prefer to use olive oil, but in recipes that call for quite a bit of oil, it gets expensive. For these two above, I use canola oil. What oils to others of you like to use in salad dressing and why? Thanks, I will try canola oil! Do you have a from-scratch ketchup recipe? I have one that was my great grandmother's, but it calls for sugar. I am really trying not to purchase salad dressings anymore (except maybe Bragg's Apple Cider Vinaigrette which my family loves), so I appreciate any recipes that are sugar free! Thanks! Thank you for these! Both look awesome! How long do these last in the fridge? We don't have salads as often as you do, so would need something that would keep pretty well or make smaller portions . . .
Patty, the longest either of these lasted fr us was two weeks, but that's because that's the longest it took us to use them up:-). So, I would say they last at least two weeks, but if you don't think you will use it all in that amount of time, make smaller portions. Or! Increase your salad consumption:-). Drizzle olive oil over the leaves. Stir gently with salad tongs to coat all the leaves. Lightly sprinkle kosher salt (very important! don't sub table salt!) over the leaves. Stop and do a taste test. Lastly, drizzle a bit of balsamic vinegar to taste. I serve this to guests a lot and I always get rave reviews. The friend who taught me this used to rub the salad bowl down w/ shallots or garlic. I usually skip that cause I'm lazy. Mindi, Will you believe it that I read your comment and ran to the kitchen to try it? Well, I did and it's fabulous!! Thanks for the suggestions. I'm going to throw this method into our salad prep rotation. Yum! I rarely have shallots on hand, so they are left out quite often. It still tastes great without them! This is so light and yummy! Makes me never want another bottle of store-bought dressing to enter into my house! Dana D, This is exactly what I was looking for! A truly sugar-free salad dressing! And also Mindi, with the drizzling and sprinkling and drizzling again. Thanks, ladies! this is just what i needed!!! thanks so much! Thanks for adding these to the Salad Dressing Exchange, THHP! I've very excited to make the switch to homemade for good! I'm definitely going to try the Garden Salad Dressing, different, thanks for sharing! Thanks so much for sharing these recipes! I've wanted to find a dressing with honey!